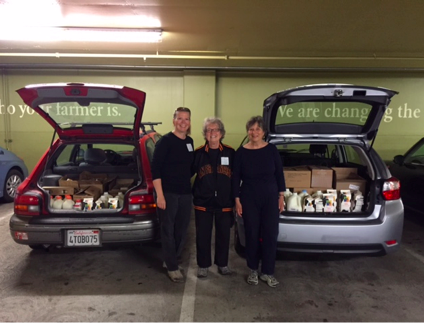 We three Food Runners volunteers, Dede Tisone, Dawn Daro and Lisa Moore-Long meet every Saturday at 9:00 am at the loading dock of Whole Foods at 450 Rhode Island. The first order of business is to check the bread bin. Here we receive boxes of bread, cakes, cookies and canned items that we load that into the two cars. 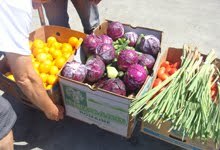 Then we head into the produce area to box up grocery carts of leftover grapes, containers of cut fruit, peppers and melons. We roll everything down the ramp on carts to our cars and head to the deli for sandwiches, soups, and salads and on to dairy for bottles and cartons of milk, cream eggs, butter and yogurt. 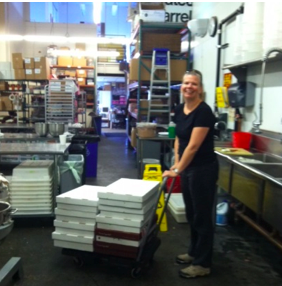 We load all the dairy, deli and frozen food into the two cars. But we aren’t done yet. We have a second pick up at Kara’s Cupcakes main bakery at 3rd and 23rd Street. We usually receive anywhere from 4 -20 boxes of cupcakes. These are the all-time favorite of everyone at the shelters. 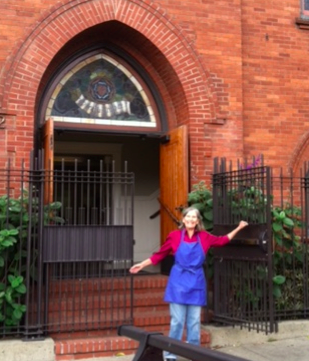 With our pick ups complete, Lisa heads to the St Francis Lutheran Church on Church and Market across from the Safeway. 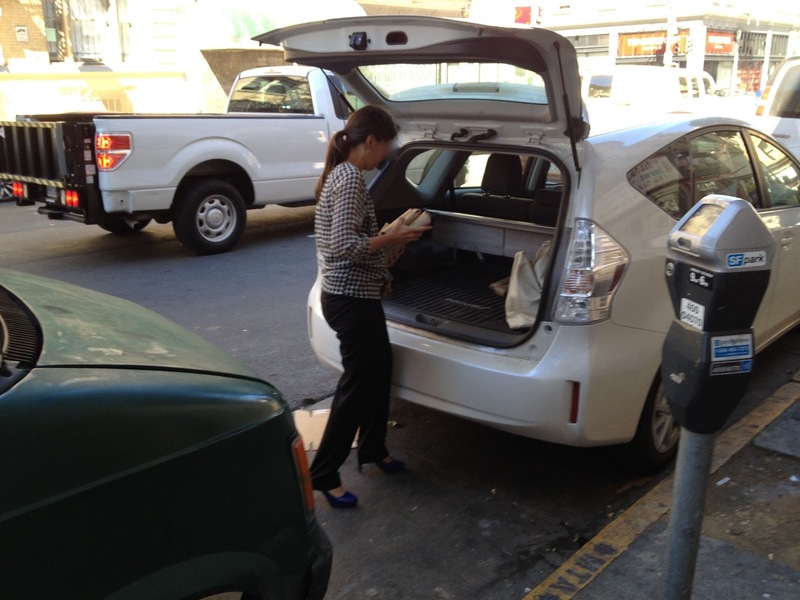 When she arrives, she is greeted by volunteers who are always very happy to see her and help her unload the car. After doing this run for a number of years Lisa has gotten to know the people on the receiving end well and they have become friends. 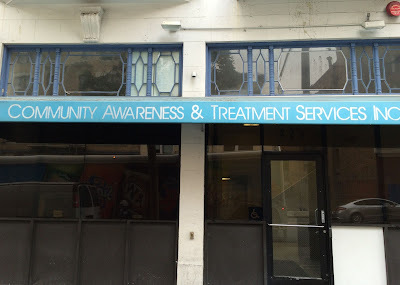 We, Dawn and Dede, deliver to City Team, a nondenominational non-profit with a medical clinic and clothing closet that serves the poor and the homeless in San Francisco providing dinner to men, women and children Tuesday-Friday and an “All You Can Eat” lunch on Saturdays. There are usually a few guys hanging around and that is a good thing because if the door is closed, a bell has to be rung that is above the gate and out of the reach of these ladies. Soon the door opens and the real “first” team arrives to unload the car. This too is a good thing, because the boxes of bananas can be really heavy. They don’t let us lift a thing, insisting that we stay where we are. In less than 3 minutes the whole car is emptied and with many a “God Bless you” we are on our way. The three of us have been doing this run for five years. Dede drives across town, Dawn drives from Berkeley, and Lisa from Foster City just to be able to go on this gratifying mission every Saturday morning. It doesn’t always seem like the sane thing to do, my 3PM Friday afternoon Financial District food run. Traffic on Battery Street, where I pick up, is always bumper-to-bumper starting as early as noon. My pick up is at Lookout, a tech company specializing in predictive mobile security. Like so many of the local tech companies, Lookout supplies their staff with in-house lunches on Fridays. Lookout generously donates the leftovers from these lunches to Food Runners. I volunteer as the "regular" (weekly) food runner for this run. I've been doing the run for almost two years. The donations from Lookout are always amazing. I deliver the food to CATS (Community Action and Treatment Services) Eddy Street Apartments, a subsidized housing facility for low-income residents in recovery located in the Tenderloin. San Franciscans familiar with city streets and traffic patterns might think I'm crazy to make this trip every Friday. But, when it comes down to it, how could I choose not to, especially since the food I'm picking up might otherwise go to waste. "I am only one, but I am still one. I cannot do everything, but still I can do something; And because I cannot do everything I will not refuse to do the something that I can do." Food Runners is something that I can do. I may not have large chunks of time to commit to volunteering, but without Food Runners, fresh, nourishing resources would go to waste, instead of helping sustain my neighbors in need. One hour at 3PM every Friday to do something amazing for my community... insane? I think not.